The results of a new report on toxins in the environment suggests that over 200 million people across the world are at risk of illness from industrial pollution. The new report is called The World's Worst Pollution Problems, and it's the 11th year the study has tracked the world's most dangerous pollutants and their impact on the environment and us. It is a joint project between Pure Earth, an international nonprofit organization dedicated to solving pollution problems in low- and middle-income countries, and Green Cross Switzerland, an organization that promotes sustainability, security and on-site reaction to environmental disasters. This year, the team decided to gauge the impact of pollutants based on the amount of disease they cause instead of just the amount of landscape they cover. In a press conference, research director Jack Caravanos explained that while there may be some places that are polluted on a much larger scale, a lot of those places are rural and isolated. But when you put people in the mix, "a lot of pollution in a small space does a lot more harm," he says. And "by using human health as the indicator, we are capturing the problem in a better way." To get an idea of the disease footprint being caused by pollutants, the team used a gauge called "Disability-Adjusted Life Years" or DALYs. DALYs were created by the World Health Organization to gauge the impact that disease and poor health can have on a normal human life. For instance, the average healthy person might live to age 70. But someone who smokes throughout his life should expect to live only to 60. Smokers can expect to lose 10 DALYs off their normal lifespan. The same goes for any kind of disease or addiction or exposure to pollutants. All in all, the new report says that the top 10 pollutants account for the loss of 7 million to 17 million DALYs in low- and middle-income countries. The report estimates "that there are perhaps 150,000 sites in the approximately 50 countries where investigations are underway," and that an estimated 200 million people are at risk from pollutant contamination at those sites. 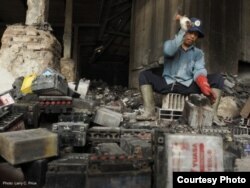 By far the single most deadly source of contamination is lead from the recycling of lead-acid batteries. According to Caravanos, lead poisoning on a small scale is causing cognitive damage that "begins at an early age and is irreversible." But he also says there is growing research linking lead exposure to cardiovascular troubles in adults. When batteries are recycled properly, there's no real threat, but the rising price of lead has created small backyard industries where recycling is being done in a way that's dumping huge amounts of lead into the ground and into the air. According to the report, "used lead-acid batteries are broken up using hand axes or hammers; smelting of the metallic components occurs out in the open or inside domestic homes; and the toxic waste products are disposed of into the surrounding environment untreated." The report identified more than 150 sites in researchers' database with over 1 million people at risk from this type of lead poisoning. The report estimates that the combined impact of recycled lead and lead smelting are costing people between 3 million and 7.3 million DALYs. The report pinpoints industrial mining and ore processing as the second most dangerous polluting industry. These industries use lead, chromium, arsenic, cadmium and mercury to remove precious metals out of the ground and create highly polluted runoff. The reports says that in "poorly managed mining and processing plants, untreated wastewater, slag and solid waste are often directly dumped into surface waters or may accumulate near the mines." The report suggests these kinds of operations put nearly 7 million people at risk from mining and ore processing locations in the countries in which Pure Earth has done investigations. Small-scale gold extraction industries make up an estimated 20 percent of the world's gold production, but according to the report, they release more mercury into the environment than any other industry, putting nearly 3.5 million people at risk from mercury poisoning. 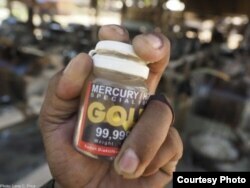 While people involved in gold extraction can ingest mercury vapor directly, millions of others are being exposed to the heavy metal as it is easily absorbed through waterways and soil and through fish in the food chain. For the rest of the list, check out the report. David Hanrahan, director of Global Programs at Earth Pure says there's both good news and bad news in the efforts to fight this kind of pollutant contamination. On one hand, he says there is an increasing move all over the world toward "sustainable development which helps solve the problems of waste and pollution." On the other, he says that the "more we understand about health, the more we realize that relatively small amounts of toxic substances can have long-term serious effects on people." The report concludes that "cost-effective solutions to treat and prevent the problem already exist," but that groups like Pure Earth can't solve the problem without "continued and increased international support." Kevin Enochs is an award-winning content creator who has been explaining the intricacies of the natural world to television and online audiences for over 20 years. He perfected his craft working for CNN and the National Geographic Channel before heading to the Voice of America in 2012.